This building in Douglas's Main Street was originally the village tolbooth and latterly the Sun Inn. It is now a private house. Following the Battle of Airds Moss the head and hands of Rev Richard Cameron were cut from his body by James Bruce and taken to Edinburgh to claim the bounty that had been palced on them. The soldiers stopped in Douglas overnight, and the bag containing them was left in a cell on the gorund floor. The seeping blood from the bag marked the floor, and this is still visible today. 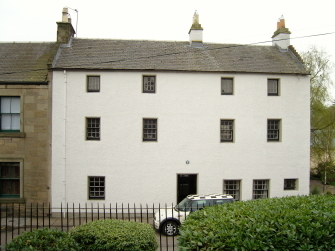 The former inn is located in the High Street, overlooking the old church and kirkyard. Access is not normally available as it is a private house.